My son loves fruits. Apple is among his favorites. 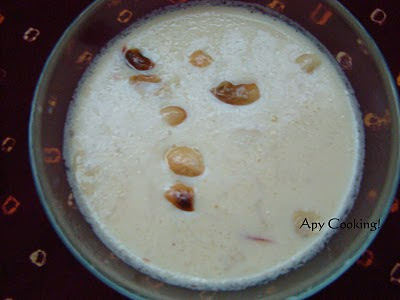 When I came across this website, I was motivated to make Apple Kheer. However I had neither apple butter nor applesauce at home. So I referred to this website, combined the two recipes and came up with the following recipe. The result was not too bad. Also, I had just one apple at home. If you want a stronger apple flavor, you could try using 1 and 1/2, adjusting sugar accordingly. Microwave the grated apple in a microwave safe bowl for 3 mts on high. Allow to cool. Take half the quantity and blend with a few spoons of milk to form a paste. Mix remaining milk, condensed milk and sugar and microwave on high for 5minutes (keep stirring). Add saffron strands, grated apple, apple paste and microwave for another 2 minutes. Remove from microwave, add cardamom, nutmeg and salt and mix well. 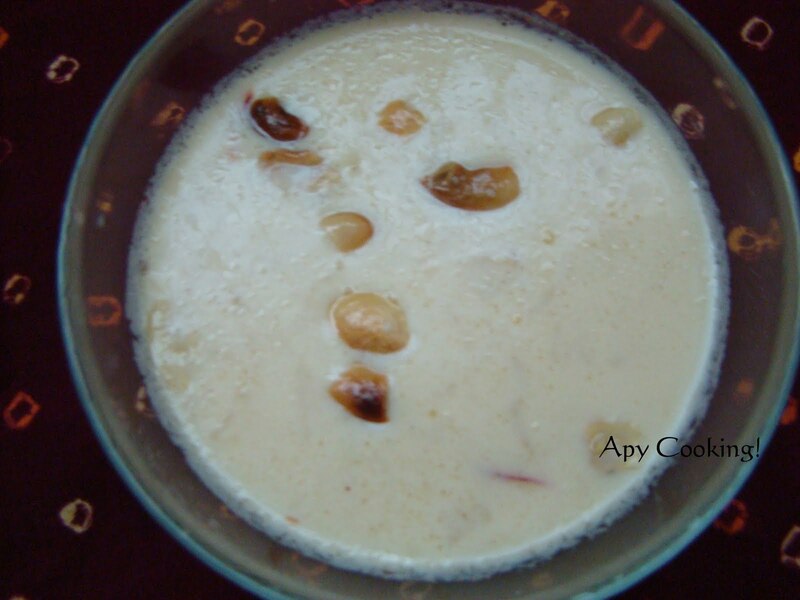 In a small microwave safe bowl mix 1 tsp ghee with the cashewnuts and microwave for 1 minute. 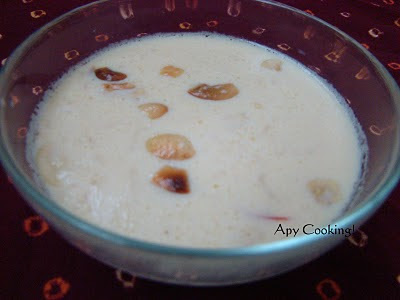 Pour on the kheer. Refrigerate and serve chilled. 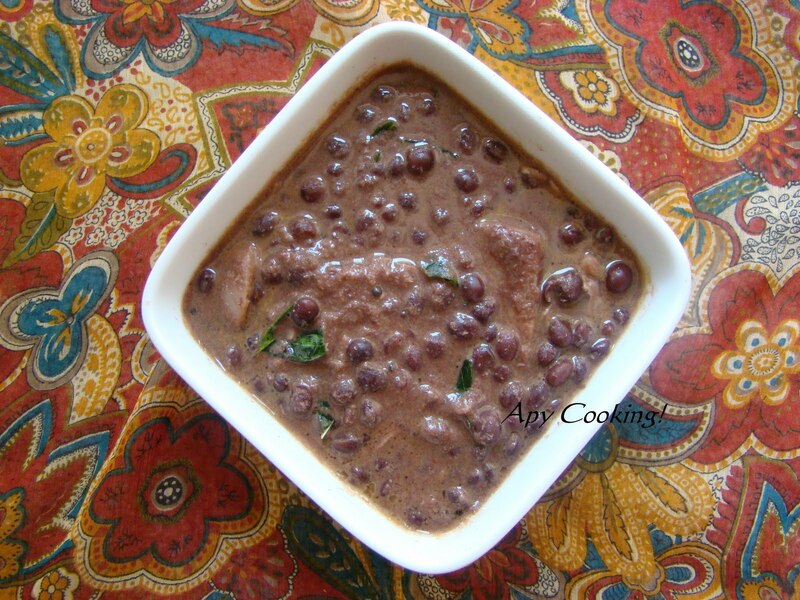 Sending this to MEC - Favorites hosted by PJ, started by Srivalli, to EFM- Sweets and Savories for Diwali, to Akila's Dish name starts with an A and to Microwave Easy Cooking - Potluck Party by Srivalli. I was very keen on trying out some eggless muffins. Also, I wanted the muffins to be made of whole wheat, include a vegetable, no nuts and not too sweet. Finally after looking around on the net, I came across this and this, but modified them to suit my requirements. I made a small quanity, so this recipe makes about 7 medium sized muffins. 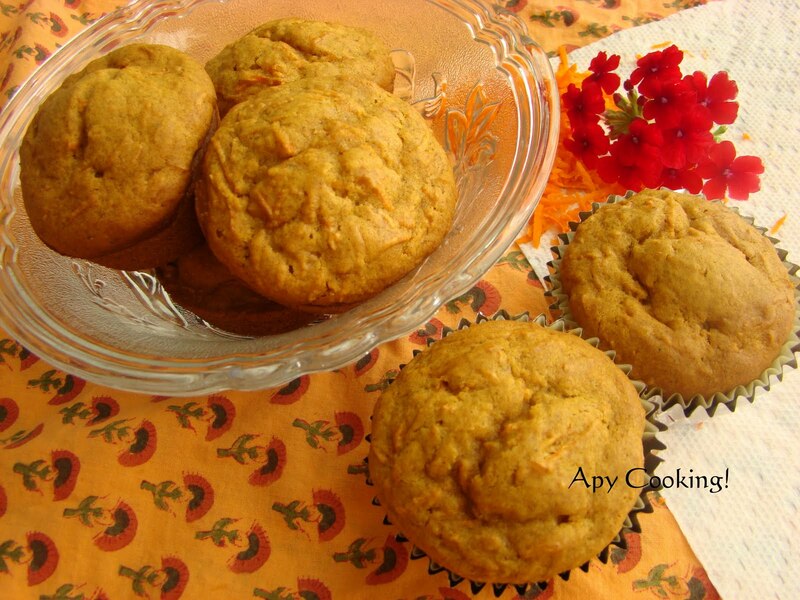 Combine flour, baking soda, baking powder, salt and all the spices. Cream butter and sugar. 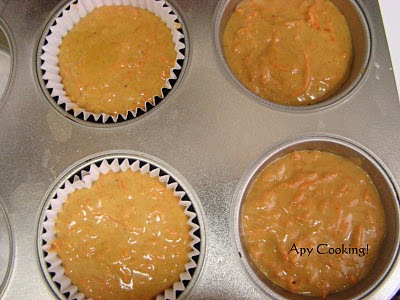 Add the flour mixture, carrot and milk and mix well. Line a muffin pan with paper muffin cups. If you don't have them, you could grease the pan. Pour the batter into the cups so that they are 2/3rds full. Bake at 350F for 25 minutes (or until fork inserted comes out clean). And enjoy the healthy muffins. This post goes to Veggie Platter's Healing Foods - Carrots, originally started by Siri's Corner and also to Only Kid's Delight. What is Kali Tori? 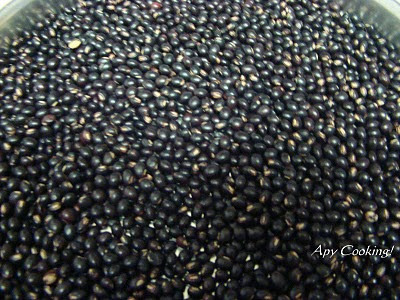 Kali in konkani means black and tori, I learnt recently are pigeon peas. 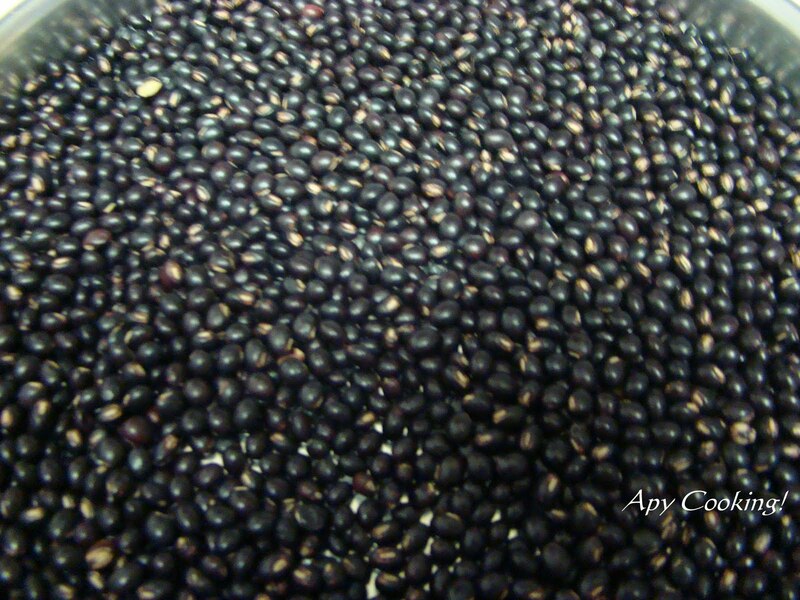 So kali tori, as you guessed, are black pigeon peas. Also, I checked around on google and found out they are also called kadyos. Looks like I need to make a trip to The Ranch Market to see for myself. Wash the peas and soak in 2 cups of water for a few hours (or overnight) and pressure cook till almost cooked (about 3 whistles). Meanwhile, grind the coconut with chillies, tamarind, salt and just enough water to form a paste. In a deep bottomed vessel, heat about 1/2 a cup of water and boil the jackfruit pieces. I used about half a can, you could use the whole of it if you are fond of it. You could use the pieces as they are or chop them into smaller chunks. Just make sure you wash them really well to remove the smell and taste of brine. The ones in the can cook fast, so if you pressure cook them with the peas, they may become soggy and mushy. Add the peas along with the water and cook for some more time . Add the coconut paste, salt, water if needed and bring to a boil. 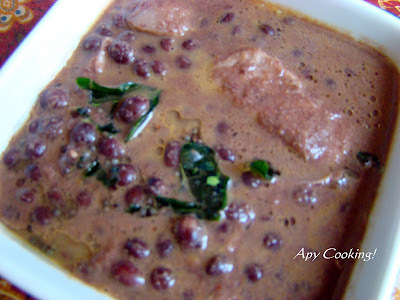 Serve hot with rice and dal. And some lip smacking pickle! Sending this recipe to MLLA event hosted by Siri, originally started by Susan. One day in Target, as I was walking down the aisles (and by aisles I mean the labelled sections of the store! ), I saw a bag of chocolate chips. And what was the first thought that crossed my mind? Chocolate chip cookies, of course! I was running short of time, so I just grabbed a bag of chocolate chips, cashed my groceries and only later did I realise that chocolate chip cookies are usually made with semi sweet chocolate chips. What I had with me were milk chocolate chips. But wait, on the back of the bag was a recipe for Milk Chocolate Oatmeal Cookies. And Nestle wouldn't have put it there if not for the success stories of the recipe. Worth a shot! Mix the dry ingredients - flour, baking soda, baking powder, cinnamon and salt and keep aside. 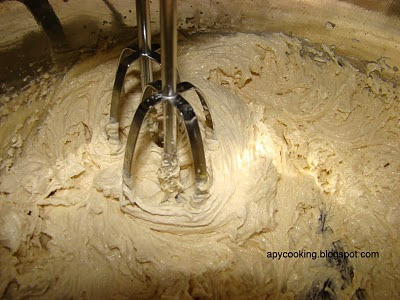 In a large bowl, with an electric mixer, beat butter and sugar. Add vanilla and egg and beat for some more time. Beat in the flour mixture little by little alternating with milk. Add the chocolate chips and oatmeal. Do not beat. 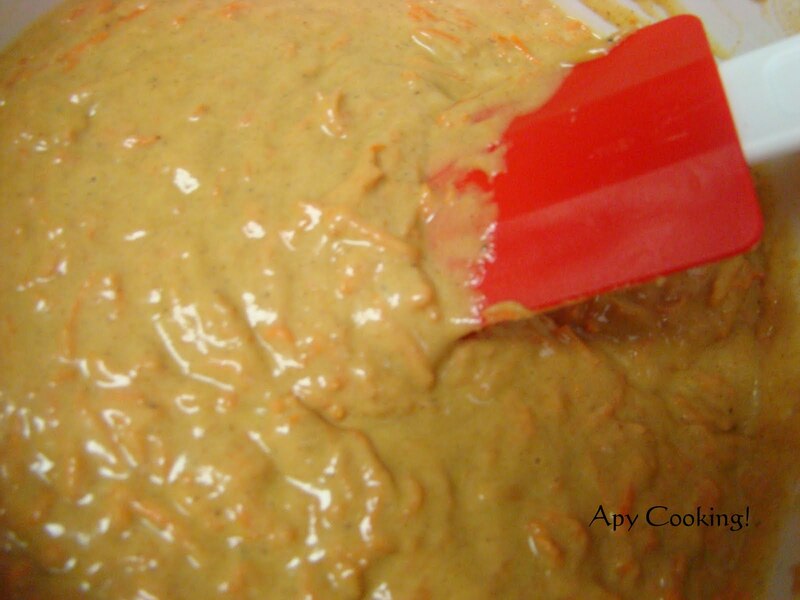 Just mix with a spoon or spatula. The recipe asks you to 'drop by rounded tablespoon onto ungreased baking sheets.' What I do is refrigerate the mixture for an hour or two. Then scoop out a tablespoon of the batter, roll it into a ball, place it on the baking sheet and dab it a little with my fingers. 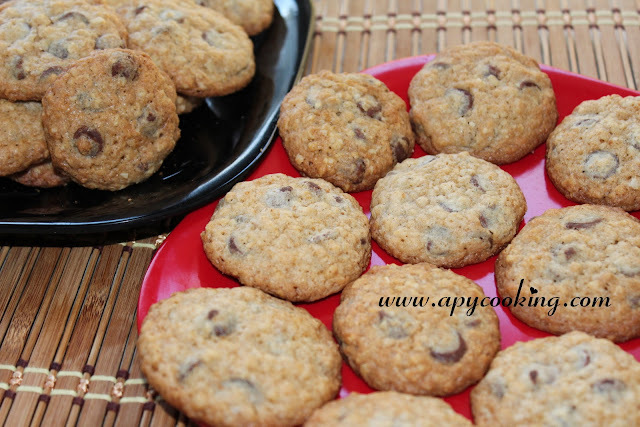 The advantage of using a tablespoon each time is you get cookies of the same size. Bake for about 12 minutes at 375F. The edges should look a little golden brown. The cookies will be soft. Allow to cool on the sheet for a couple of minutes. The center will become harder after the cookies cool completely. Here are the cookies, and your kids will not even know they have oatmeal in them. Nice way of sneaking in some fibre, eh? 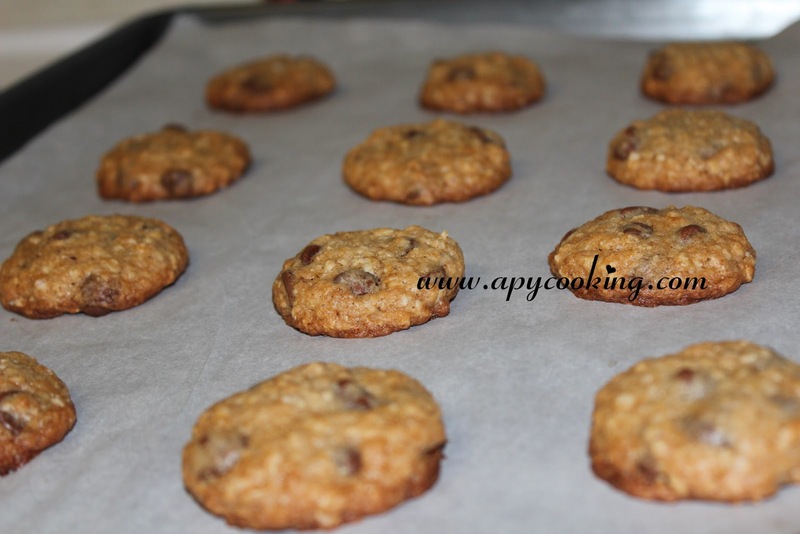 [If you'd like to make these cookies eggless, check my post on Eggless Chocolate Chip Cookies which explains replacing eggs with flax powder]. This is one of my favourite breakfast items, and the best part - no soaking, grinding and overnight fermenting! Except the half hour soaking of the vermicelli in the curd. Recipe adapted from Shilpa's blog. In a pan, heat ghee, fry vermicelli and rava for 5 mts. Remove from pan and soak in curd (yogurt) for half an hour. Mix coconut, chillies and corriander leaves. Shilpa suggests adding more curd if the batter becomes too dry (which I invariably end up doing). Separately, heat oil, add urad dal, chana dal, mustard seeds, curry leaves and baking soda. Add it to the vermicelli mixture, add salt and mix well. 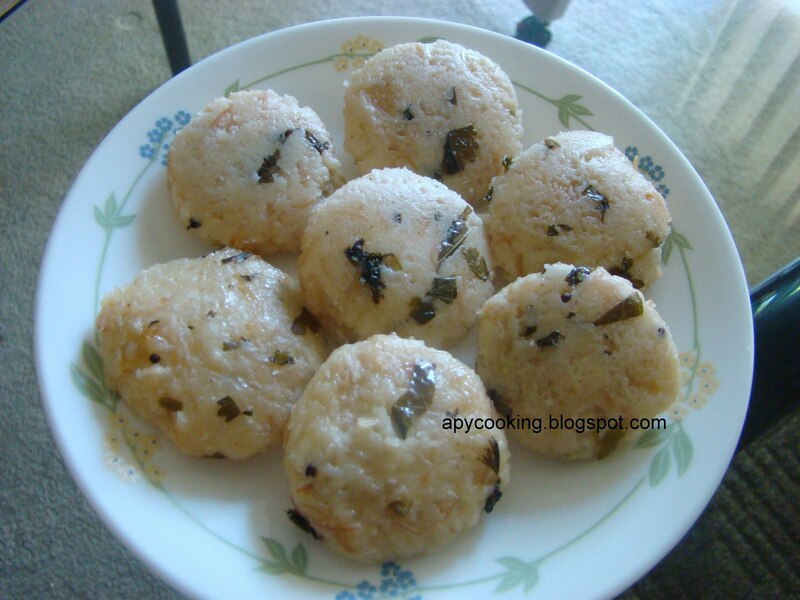 Grease the idli stand, place the batter and steam. Tastes good with green chutney. Shilpa suggests chutney powder.